Since more sidewalk needs to be "cut away" to create the larger radius, the unprotected pedestrian crossing is longer. 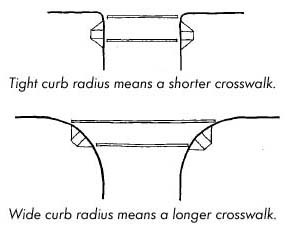 The larger radius allows vehicles to take the corner at a higher speed, further increasing the danger to pedestrians. 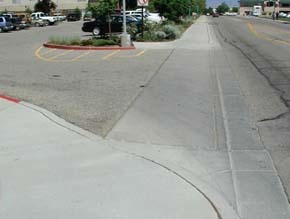 This photo show a large curve radius, designed to allow busses to exit a parking lot. The result is that automobiles can exit at higher speeds, and the unprotected crossing is about 50 feet wide.